We were pleased to attend the opening reception last night for DIVERGE, a group exhibition featuring the Master's thesis projects of 18 graduate students in the Digital Futures Program at the Ontario College of Art and Design University (OCADU). Graduate Studies at OCADU and the Canadian Film Centre’s Media Lab (CFC Media Lab) are proud to partner as hosts for this annual event. An innovative, student-centred program, Digital Futures has part-time Graduate Diploma and full-time Master's Degrees (MA, MDes and MFA) options. The program responds to the increasingly important and sophisticated role of digital technology as a catalyst for change, and draws an international student cohort and faculty – a perspective key to securing its graduates futures in the ever-evolving, global, creative digital industries. These multi-disciplinary designers and artists’ creative and intellectual labour are on full display at this exhibition. Playing on the meanings of “diverge” – to move in a different direction or shift and adapt into new forms – DIVERGE reveals an eclectic range of thesis projects in: artificial intelligence (AI) and communicative domains; augmented reality (AR) and virtual reality (VR); civic media; digital and electronic fabrication and digital art; educational video games; gesture technologies; information visualization; immersive storytelling and audiovisual environments; participatory multimedia and performances; post-physical sculpture; and therapeutic devices. What draws us all together as students in this program is that we are creative and forward thinking about the future of technology. 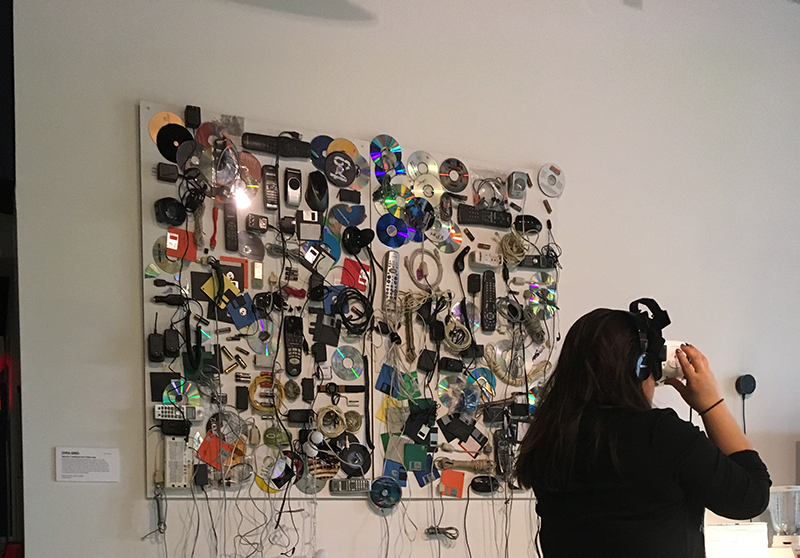 Designer, fine artist and writer Samaa Ahmed’s Digital Debris: Visualizing the Future of Global E-Waste, which immerses a viewer in a landscape that forces them to confront the scope of, and urgent need to address, e-waste issues on a global scale. Multimedia designer Bijun Chen’s Masters of Laoting Shadow Play: Experience traditional art practice in a virtual space, which examines how the rise of the digital has replaced or displaced more traditional art forms like shadow plays; by engaging in field research in China with one living master practicing the art form on the edge of extinction, Bijun produced an immersive 360 documentary short that recreates the viewer’s experience of these forms. Designer, audiovisual artist and music researcher Afaq Ahmed Karadia’s Embodied Expressions reworks audiovisual performance systems to expand artist practices. Modern electronic music performance has decoupled sound from the material objects that create it; in his piece, Karadia juxtaposes this practice to a set of musical instruments placed in the audience’s environment, which the performer can custom-control through a gesture-based system. Editorial designer Ania Medrek’s News by Association: Designing a Way Out of the Echo Chamber, part of a larger project called Echology, engages with Participatory Design methodology to identify and unpack what contributes to the echo chamber phenomenon on – and limiting algorithms of – social networking sites. Congratulations to all of the talented Digital Futures graduates: Samaa Ahmed, Thoreau Bakker, Bijun Chen, Mudit Ganguly, Sara Gazzaz, Manik Perera Gunatilleke, Yawen Guo, Afaq Ahmed Karadia, Mahsa Karimi, Nadine Lessio, Ania Medrek, Katie Micak, Natasha Mody, Afrooz Samaei, Hammadullah Syed, Shreeya Tyagi, April Xie and Rana Zandi! Don't miss DIVERGE this weekend! The exhibition takes place at the 49 McCaul Street Open Gallery in downtown Toronto from Friday, April 13, through Sunday, April 15, 12 p.m. to 6 p.m. daily. For more information, visit the OCADU website here. Our students don’t just make things with emerging technologies - they think creatively and critically about how, why, and when we should use and engage with these ideas and tools – and when we should not. The artworks, prototypes, demonstrations and performances in DIVERGE bring this research to life in a rich interactive format. Responding to the increasingly important role of digital technology for integrating societal, cultural and economic change.